NASSAU, The Bahamas - The National Emergency Management Agency, NEMA, partially activated the National Emergency Operations Centre (NEOC), to closely monitor the movements of Tropical Storm Kate and its potential threat to the Islands. A core team from NEMA administrative staff and of the Department of Meteorology will be stationed at the NEOC to monitor the system and to ensure that proper procedures are followed. On Monday, November 09, 2015, The Bahamas Department of Meteorology issued tropical storm warnings for the islands in the Northwest and Central Bahamas, This includes Grand Bahama, Abaco, Andros, Bimini, The Berry Islands, New Providence, Eleuthera, The Exumas, Cat Island, Long Island, Rum Cay and San Salvador. A Tropical Storm Warning means that tropical storm conditions can possibly be experienced in those islands within 12 to 24 hours. The storm comes with maximum sustained winds of near 45mph. Director of NEMA Captain Stephen Russell said Family Island Administrators were contacted, to ensure that they met with their local disaster committees on their level of preparedness and to have hurricane designated shelters open in the event of evacuating low-lying areas. The Glass Window Bridge in North Eleuthera was closed, due to the weather condition, which makes the structure impassable in such instances. Bahamasair announced that due to the threat of the storm, its flight to San Salvador scheduled to depart Nassau at 2:05pm was postponed to a 9am fight Tuesday, November 10. The airline also announced that further advisories regarding flights to Marsh Harbour and Eleuthera will be issued. 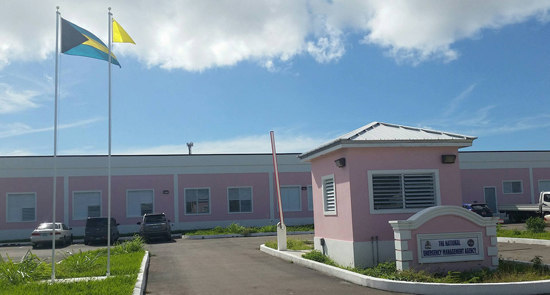 Due to the potential flooding in low-lying areas, residents in the mentioned islands are asked to take the necessary precautions to safeguard themselves and utilize the hurricane shelters, if necessary. NEMA follows Standard Operating Procedures (SOPs), which provides instructions for activation and the operations of the NEOC, amongst other things. Level I deals with monitoring the system and its projected path, which is 60 hours out. Operations Officer will monitor the progress and keep the Director of NEMA informed. Also, a green flag would be hoisted outside NEMA's office to indicate this level. Level II or partial activation, which NEMA implemented Thursday, means that the situation has escalated into a real threat to the islands or areas in the projected path 48 hours out. The situation escalates into a real threat such as storm warning, flash flood warning, etc. A yellow flag is hoisted to indicate this. During this phase, a watch is issued which means that the storm is 48 hours or two days out. Residents are advised to take the necessary precautions - to protect themselves and their properties. Level III will see an orange flag hoisted, which means emergency conditions exist for example, flash flooding or tornadoes. Also, the NEOC will be activated and utilize the necessary personnel. And at Level IV, a red flag would be hoisted which means full activation. The Prime Minister of the Commonwealth of The Bahamas will be advised to address the nation on the potential destruction the system would cause. By this time, residents should be in a wait and see mode and should have already made all preparations for landfall. Such preparations include securing personal documents and seeking designated approved shelters in the event an evacuation order was previously issued. This means the system is 36 hours out. The ESF groups are made up of personnel from essential services such as health, police force, defence force, water, electricity, communications, shelter management, and other related areas.